I’m a desktop boy. I like the large monitors, a full size keyboard, a big (Blue Yeti) mic, and speakers with a subwoofer. Of course, this is very impractical for travel. In the old days of commutes, floppies, and CDs I preferred a single laptop for work and home. But today, most of my content is in the cloud. So I use a desktop at home and a laptop when I travel. My Surface Pro 3 broke – not sure why. But I won’t miss it! 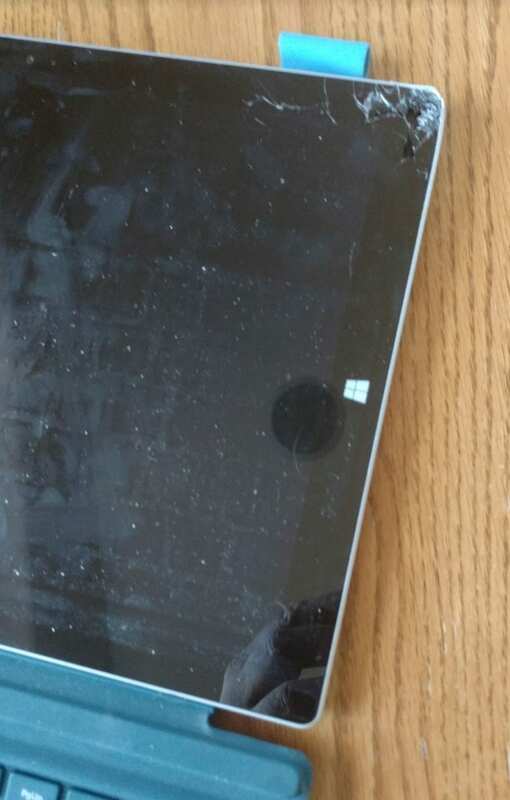 The only thing worse than a Surface Pro is a damaged Surface Pro. I’m not sure how/where/where, but the corner is dented, and the screen is cracked. For those of you that work at big companies and complain having no say in your tech, let me tell you there’s at least some value in being able to delegate tech purchasing decisions. I was thinking that a Chromebook might be the perfect travel device. They are cheaper, easy to maintain, and offer reduced risk of virus. They are very fast to boot and have long battery life. The real limitation is there’s life beyond the browser. However, Google announced its intend to bring Android Apps to the Chromebook later this year. This means the Chromebook would be able to run applications such as MS Office, Skype, and Evernote. Keeping in mind that I minimize my local content anyway, I decided to go for it. I began my search for the perfect Chromebook. My search ended with a Lenovo Yoga 900S running Windows 10. The price difference was minimal. Cheap Chromebooks are cheap, but nice Chromebooks are expensive. I spend a lot of time in front of a computer and wanted a high quality device. The best Chromebooks were the Google Pixel ($1500) and Dell Chromebook 13 ($1200 as I configured it). Not cheap devices. The Touch-screen is a new concept for Chromebooks, but it seemed reasonable due to the upcoming support of Android apps. Touch-screens are very limited on Chromebooks. The Dell was the only reasonable high-end model. Between cycles. Unfortunately, the Dell is about a year old. It was one of the only models that didn’t have USB-C. It had older processors and slightly more weight. The new models, like the new HPs, didn’t have touch-screens. The Pixel had it all – but it was sold out, and then eventually discontinued. I suspect a whole new generation of Chromebooks are about to come out – with USB-C and touch-screens. Acer already announced one, and both Dell and Lenovo indicate touch-screen models are coming. But I needed to buy something now. I realized I was in a holding pattern to spend at least $1300 for a Chromebook that doesn’t exist, so I decided to take a peek at Windows laptops again. I asked around and found general consensus that the Lenovo Yoga books have the best keyboards. I like the idea of a convertible laptop primarily for watching movies on airplane tray tables. One time I signed a document on my Surface Pro, so figured a pen had value too. The 900s is a slightly smaller version of the 900. It’s a convertible style Yoga for less than $1200. It has a 6th generation M7 (fanless) processor, 12.5″ touch display, 8/256 GB of storage, pen, and a 7 hour battery. The (lighted) keyboard is excellent, and it only weighs 2.2 lbs (4 ozs less than the SP3+keyboard). The power brick (hard to tell online) is on the smaller side too. The 900S won on its specs, features, and price. No Chromebook for me this time. So far I have only one complaint. No HDMI out. I had to buy a dongle for USB-C to HDMI. Note to Google: I’m a big fan. I have multiple GApps domains, an early Chromebook, and an Android phone. I already use Chrome as my primary browser along with multiple extensions. I wanted a Chromebook, and set out to buy one – the fact that I didn’t says something. The prices are high, the selection low, and the commitment is unclear. There were tons of rumors about the Chromebook going away. I waited a month for the Pixel to reappear only to find it it was discontinued -bad form! I hear great things about your new Enterprise leader Diane Greene, but all she has publicly talked about is Google Cloud v AWS. Your commitment and communication to Enterprise is weak. Note to Mac Fans: Yes, I know you love your MacBook Air. I suspect It is a fine computer and I am very happy for you. At one point the Apple products were much more expensive than PCs – though no so much any more. I’m happy to admit the Macbook is more elegant overall, and I’m sure my number one app (the browser) is far superior on a Macbook. I did havea TiBook a decade ago, but for various reasons ended up back on Windows. I’ve decided to stick with Windows. I wish you well with your choice, please respect mine. Subscribe to TalkingHeadz on your favorite podcast directory. Transcription provided automatically by Otter.AI.